I love watching the Olympics–Summer or Winter–and have for as long as I can remember. So it was a given that I would watch this summer. Less certain was whether or not I would challenge myself with a specific knitting project. Perhaps this wasn’t the year. But after finishing my two long-term projects and becoming re-energized to knit, I’ve decided to challenge myself yet again. Now, I’ve never actually met any of my knitting goals during past Olympics. But why should I let that stop me now? I’ve decided to resurrect a project I started not long before the 2010 Vancouver Olympics but which has long languished. So long in fact, that my knitting tension changed on me, so I’m starting from scratch. I’ve already frogged and the yarn and needles are now patiently waiting tonight’s Opening Ceremonies. With any luck I’ll have a finished sweater in about two weeks. Or even finished pieces would be great! I am also participating in this year’s edition of the Ravellenic Games, Team Briar Rose. 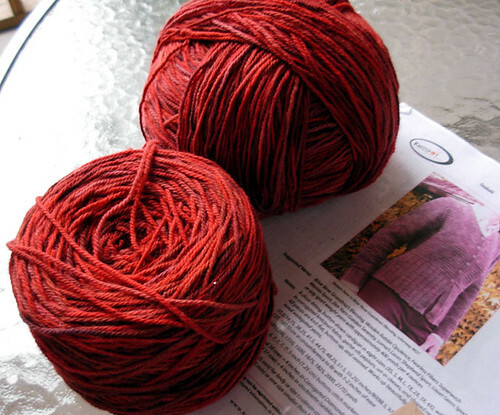 Seems appropriate since my yarn is Briar Rose Legend, a lovely 100% merino sport-weight yarn. Good luck! Shouldn’t be too hard to keep knitting, with such beautiful yarn as motivation!